As IIAAG high school rugby action resumed at GW Field Saturday, the day could not have started out on a better note. One week removed from a resounding 75-0 victory over the Guam High Panthers, the defending champion GW Geckos had their hands full with the Okkodo Bulldogs as the home team needed the entire 50 minutes of regulation to secure a draw at 12-12. From the start both teams were forced to deal with huge gusts throughout the match, which particularly kept the Geckos from their usual attacking performance. With less than ideal conditions the Geckos held on to the ball a little too long as they were swarmed by the Bulldogs defense. Poor ball handling led to errors for GW, keeping them from stringing together a series of attacks. This seemed to play into Okkodo’s strategy as scrumhalf Mark Lao took the opportunity to keep their opponents in their own territory with well-placed kicks followed by defensive pressure. Okkodo’s forward pack came out hungry, eating up yards on offense and Gecko runners on defense, making it difficult for the home team to establish a rhythm. All of this frustration came to a head as GW’s Brendan Santos was yellow carded and relegated to the sin bin, leaving his team a man down. 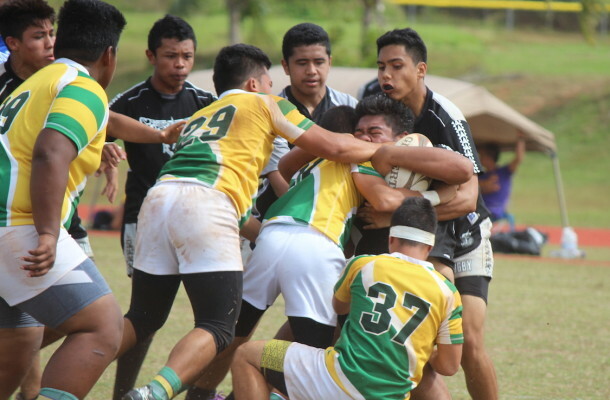 Showing their tough mentality the Bulldogs took advantage of the matchup and grinded their way into the Geckos defense, with Lao capping off their campaign with a try. The saving grace for the Geckos in the first half was the workload of their big man, Louis Hofschneider, who carried the bulk of the workload in the first half for the Geckos. However, the Okkodo defense remained strong, closing out the half and keeping the Geckos from scoring. In the second half, GW definitely found their stride and created opportunities for themselves. Several Okkodo turnovers and a yellow card to Bulldog John Olandis kept GW in the driver’s seat, as Damon Hocog found himself scoring a try on the end of a huge drive by the Geckos against the Bulldogs. However, Okkodo’s defense remained stout throughout the contest, and eventually led to their second score. Out of a lineout, winger Jaythaniel Cruz scooped up a loose ball and weaved through several Geckos defenders en route to scoring another try. That would be as far as Okkodo would get. From here, the Geckos made the necessary adjustments and their team leaders quickly took control of the game, leading their team down the field. Despite some errors earlier, GW scrumhalf Teddy Palomo redeemed himself by scoring a try. After converting their try, GW found more opportunity as an Okkodo player received a yellow card for a dangerous tackle. A huge kick put Okkodo on their heels deep in their territory, but GW could not manage to come away with any points. Following a huge kick by Okkodo to reverse field position, GW’s sweeper committed a serious penalty late in the game, giving Okoodo the chance to break the tie before the end of regulation. Unfortunately, the kick sailed wide as the official sounded the final whistle, leaving the final score at 12-12. This marks the second consecutive strong performance from the Bulldogs as last week they pushed the FD Friars throughout the game, despite losing 34-12. With back to back showings of this caliber, the Bulldogs are looking to position themselves as the dark horse in this year’s chase for the championship. Despite the slow start and a largely inexperienced team, the Geckos are still setting a standard for other teams to respect. “Second half rugby is Gecko rugby,” Quitugua added, “we want to bring the intensity.” The Geckos still sit on the throne in boys rugby in Guam, and Saturday’s result, while not preferred, is still enough to show the rest of the league that it’s going to take a lot of the right circumstances to unseat them.